Icom M605 VHF without AIS, MFG# M605 11, fixed mount radio, 25W output power, 30W listen back hailer, built-in horn/foghorn, w/ GNSS antenna, IPXS waterproof rating. The M605 is not just a radio. It’s a system that allows the user choices on how to set up the radio with up to three stations. 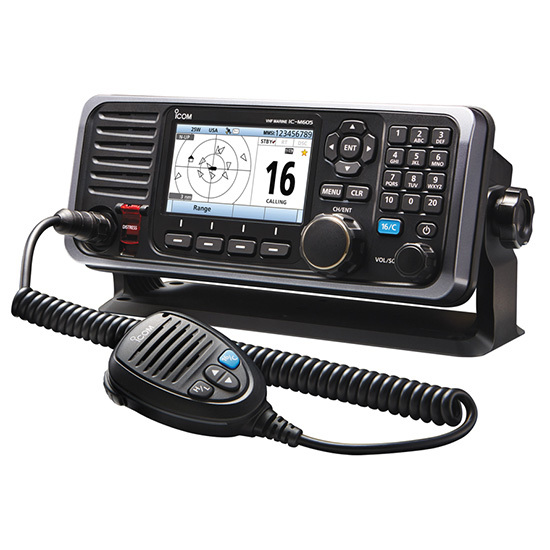 Boaters can now add an exclusive complete display as another station on the vessel along with two COMMANDMICS™. Customers will appreciate the radios large bright display that includes night mode to view easily in the dark. The full featured M605 also gives customers the option of the radio with an integrated AIS receiver. The best just got better!